Using its large space generously, the museum exhibited masterpieces of world's greatest glass artists such as Minami Tada, Libensky, and Dante. As a curator explained how each work had been made and why it had been formed into such a shape, everyone gazed at those shiny mysterious pieces curiously. My students didn't make their own glass works since we didn't have enough time to cool them off, but they seemed to find the pieces in the museum simply beautiful and interesting without thinking of difficult matters like "art". 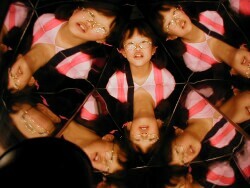 They also enjoyed themselves in a "Kaleidoscope Room". In such a warm weather that you could do only with a T-shirt, we had a good time visiting some caves, going on a hiking and sketching wild cherry trees near the cottage we stayed. Those two days were a little bit busy, but very enjoyable. When it comes a ropeway, riding on it is a good way to enjoy it. But don't you want to make it for yourself? 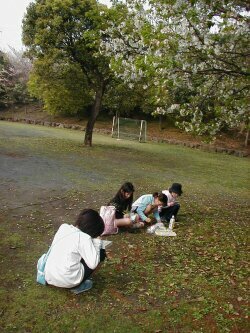 Toshimitsu, who really liked an art book of Kandinsky and made a nice painting, is good at crafts as well. 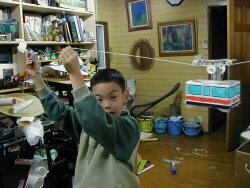 He put together many complicated parts and a stopper successfully, and made his own ropeway go to and fro.